LYB is 5% off its 5-year low (adjusting for buybacks) and is the cheapest, most levered way to play any sort of margin consistency or improvement in the ethylene business. 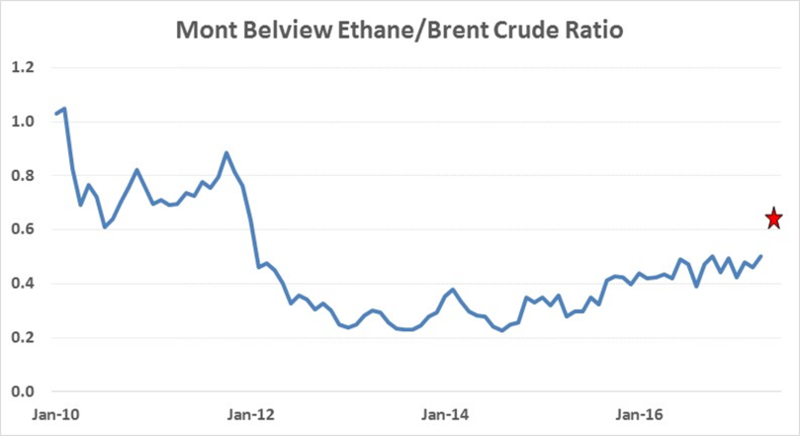 The stock suggests ethylene gets worse before it gets better. Not paid to wait if the buy-back is gone. With more than 41 pounds of ethylene per share on a global basis, following expansions in the US over the last few years and consistent share buyback, moves in ethylene margins have a profound impact on earnings. Q1 US ethylene margins were around 16 cents per pound and LYB earned a recurring $2.26 during a quarter in which the refinery lost money because of maintenance. 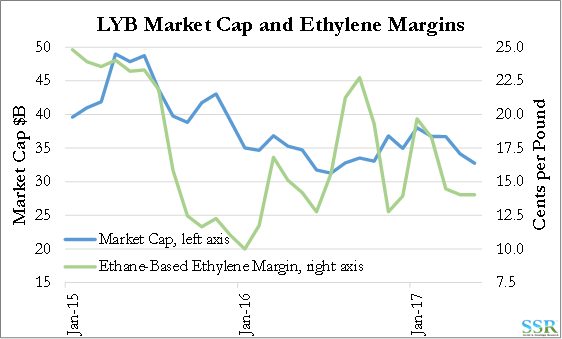 We are more positive on ethylene but have modeled margins hitting a floor of 12-13 cents per pound in a worst case in the US; at that point LYB would have zero margin in Europe. In Q1, if US margins had been 3 cents lower (our trough) and Europe had made no money in olefins at all, and we had average refining EBITDA, LYB would have made $1.33. This annualizes to $5.32 per share – worst case. The stock is currently at less than 15.5x worst case earnings. Traditionally commodity companies trade at 20+ times trough earnings, suggesting 30% upside – Exhibit 1. Even if LYB is only worth 15x trough – we are there. For earnings to go lower, oil would need to fall significantly relative to US natural gas and LYB would likely outperform many others under those circumstances given relative value. Replacement value analysis suggests limited downside with conservative assumptions, but as much as 25% downside with historic trough value assumptions. 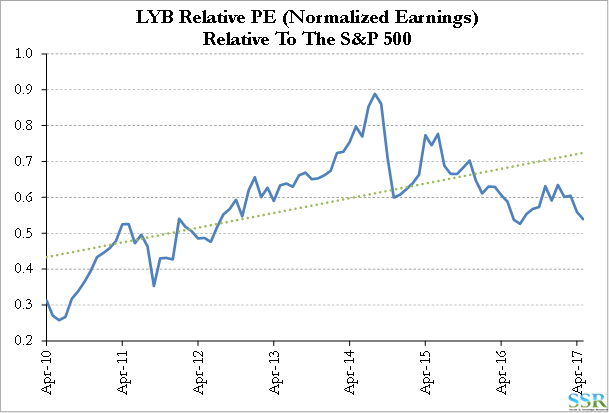 What we see today is one of the dips in valuation, based on energy and ethylene sentiment, that makes LYB more interesting, in our view. Relative downside is very limited. Management dialed back its M&A rhetoric during the Q1 conference call – it might be tactically smart to step up the share buy-back at these levels – perhaps with some large blocks or a leveraged re-cap. LYB could borrow and increase its rate of buy-back significantly based on the financial flexibility outlined in its investor day. 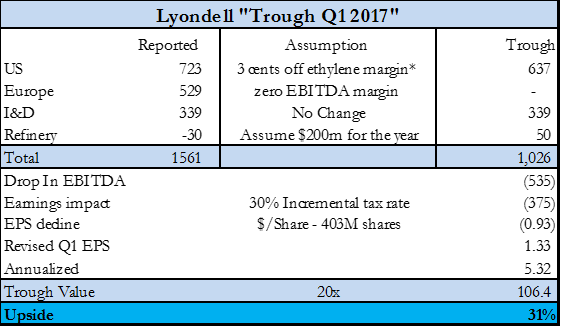 Our interest in Lyondell has been focused on its leverage to what we believe will be a fundamentally better global polyethylene market for the next 5 years than either consensus believes or what is implied in the price of Lyondell’s stock. We have also been clear that given the uncertainty and likely volatility during 2017, we would not chase the stock, but instead accumulate on weakness – right now we have that weakness. 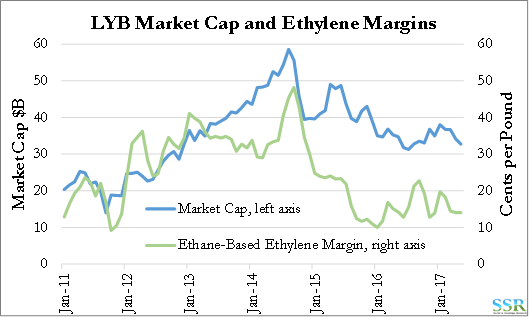 In Exhibit 2 we show LYB’s market cap and the US ethane based ethylene margin – one does follow the other. If we expand and focus on the recent period for the series in Exhibit 2 – Exhibit 3 – we see market cap (chosen because per-share value is significantly influenced by buybacks – Exhibit 4) sliding back towards the low of 2016. Given the market growth since 2016, on a relative PE basis we are approaching levels not seen since 2012 – Exhibit 5. Note that our “normal earnings” estimate (used in Exhibit 5) is $7.75 per share, versus current consensus of $9.85. Clearly the share price suggests that investors think that consensus is unattainable this year. What we have is a clear case of uncertainty around a stock that looks attractively valued. There is an expectation that the ethylene market will weaken as capacity is added but earnings expectations for LYB remain very high, never falling below $9.00 per share over the next three years. Calling an inflection point in most commodities is very difficult and we are not surprised that forward estimates lack the volatility seen in history. There are a variety of reasons which could be causing the current weakness, including the closing of the gap between crude oil and natural gas, but we think that a more important reason could be the apparent change in strategic direction – buy something versus buyback stock. We tend to think of relative PE as a measure of investor confidence and LYB’s has taken a bit of a beating since its investor day. The consistent share buyback was an offset – there may have been risk in the stock because of possible ethylene margin volatility, but there was the “paid to wait” formula of a high dividend and a consistent buyback – increasing leverage to the cycle. We are now swinging through a possible cycle that we cannot predict, with a much smaller safety net than we had before and the added risk that LYB buys something that make it worse. A deal has to offer significant synergies and not be too expensive. The Nova/Williams deal just raised expectations of what assets might be worth. From a Lyondell perspective, the margin umbrella in the US is important for the US assets – but as we point out in the earlier bullets, LYB’s European units sit at almost exactly the break-even point – suggesting that the European olefins business would make no money in a globally oversupplied ethylene market. Note that the European olefins business had operating income of only $127 million in 2012 (EBITDA of around $400 million), the last time that ethylene economics were largely dictated by the shape of the curve rather than market tightness. Our assumptions behind the $1.33 per share estimate in the bullet points are summarized in Exhibit 1 – here we are more bearish on Europe than the 2012 results. PO/SM costs the same as PO/TBA – the reality is that PO/SM is likely more expensive. We have included all of the additional oxy-fuel business, technology licensing and JV’s in “Others/Infrastructure” – as well as PP Compounding – we could be too conservative with this grouping. 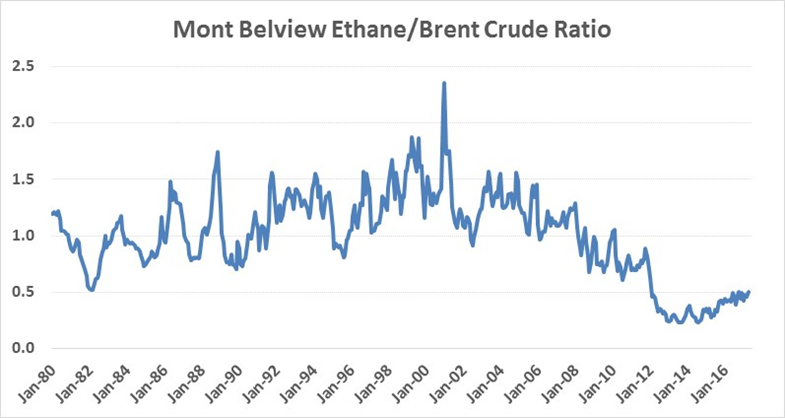 We have set the US values well below what Nova appears to have paid for Williams’ share of the Geismar ethylene unit (effectively 100% of replacement cost). We see this as a special circumstance for Nova which places more value on the adjacent land than local land values would imply. At 100% of replacement value we estimate that LYB is worth $115 per share. We have chosen the “Market Value” highs and lows based on what we think is reasonable. The Nova/Williams deals suggests we could be conservative in the US, but in a very oversupplied market we could be too optimistic in Europe. 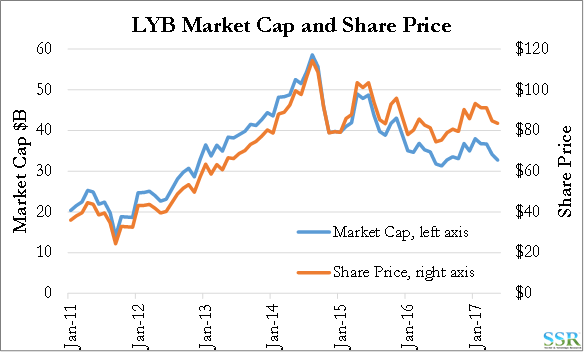 At the high end, the analysis yield a per share value for LYB that is marginally higher than the current stock price. At the low end, there is 25% downside from current values. The low end has an average below 60% of replacement value and we have seen assets change hands at this level at the bottom of cycles in the past. This is likely too low a level to be reasonable if some margin umbrella exists in the US, as in prior industry troughs every region has experienced similar levels of limited margins. Note: book value is a poor proxy here as the company lowered its asset and book value through the Chapter 11 process. Leverage – Great on the Way Up! It is all about leverage – a good thing if you are positive on the ethylene cycle and a bad thing if you are negative. Exhibits 7 and 8 show leverage per share to ethylene for all of the US companies with exposure. Exhibit 7 shows North America and Exhibit 8 shows World – including shares of JVs – data only changes for DOW and LYB. Below we repeat a couple of the Exhibits we used in the ethylene piece earlier this week. 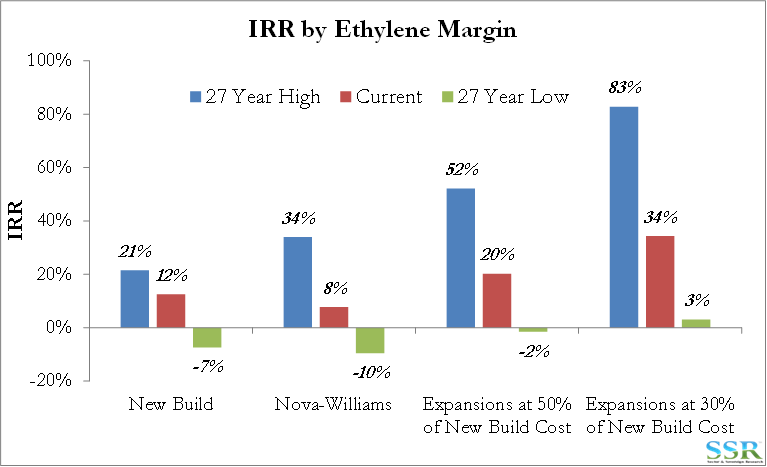 Exhibit 9 shows margins for the US on an ethane based cracker and shows current reinvestment economics – which are not covered by current margins. Most of the new builds in the US were approved in the period when margins were high (2013/2014) – not surprisingly there was a jump in capacity globally after the peaks of 1988 and 1989, which was not isolated to US ethane only crackers but was more widespread and driven by market tightness not cost advantage. None of the facilities that started-up in the 1990 to 1993 periods saw adequate margins except those in the Middle East on fixed low cost ethane contracts. LYB however has not jumped on the new unit bandwagon but has instead chosen to expand existing facilities in the US adding more than 2 billion pounds of capacity since 2012. As shown in Exhibit 10 – the plant expansions look very profitable and much more so than a new build. We understand that all of the expansions in the US (with the exception of Williams because of the start-up problems) have been in the 30-50% of replacement cost range. LYB has invested intelligently here and its next investments – polyethylene and PO/TB, both of which are brownfield new-builds – will likely not have economics close to the attractiveness of the ethylene expansions. Second: break-even cost curve analysis. The cost of ethane in the US relative to crude is rising off its lows – Exhibit 11, and while it may look insignificant in a longer-term chart, if we just show the recent history – Exhibit 12 – as well as our possible forward scenario (red star) – the possible changing landscape is very clear. Crude oil at $50 per barrel and US natural gas at $4.00 is a very possible longer-term scenario. 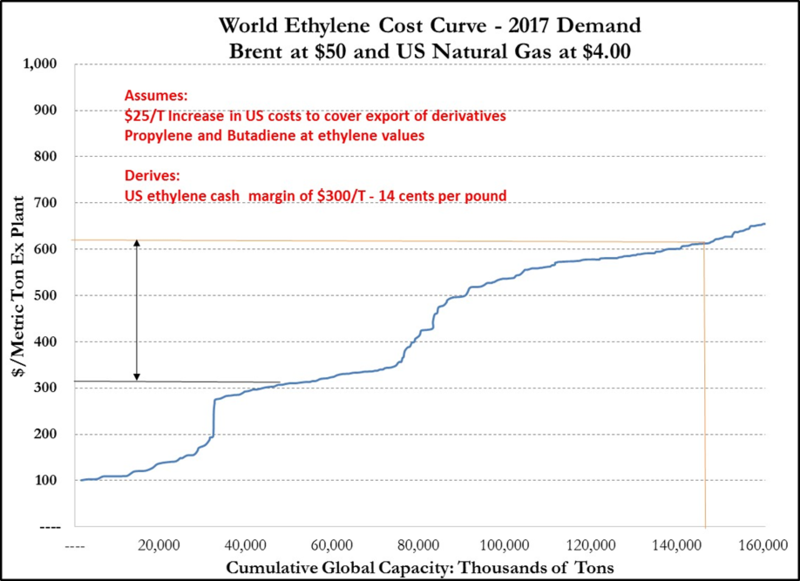 If you then assume that ethane continues to trade at a premium to its extraction value as more is pulled into US ethylene and export, the global cost curve has the shape shown in Exhibit 13, and generates a “theoretical” ethylene margin for the US of 14 cents per pound. We assume that ethylene costs in the US must increase to reflect the cost of increasing export volumes – in the Exhibit we have raised average US costs by $25 per metric ton – so just over 1 cent per pound. The physical exports will cost more, but they are only a proportion of US ethylene sales. The analysis in Exhibit 13 is very sensitive to certain assumptions – if propylene and butadiene trade at a 15% premium to ethylene the cost curve flattens and the US break-even margin falls below 12 cents per pound and if propylene and butadiene trade at a discount, the US ethane advantage is increased. Similarly – if crude rises relative to natural gas the US benefit increases. The margin/profitability calculation for these units involves crediting the value of the co-products, hence the higher the price of propylene (or any other co-product), the lower the cost of making ethylene and vice versa.